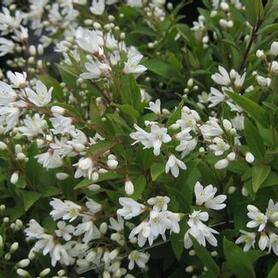 'Nikko' Slender Deutzia has delicate white flowers in April and May. The low growing neat green leaves turn purple in fall. Deutzia gracilis 'Nikko' makes an excellent flowering groundcover for sun and shade. A wonderful National Arboretum introduction. PRN Preferred: A three season groundcover shrub, a real garden workhorse. Continues to perform year after year. 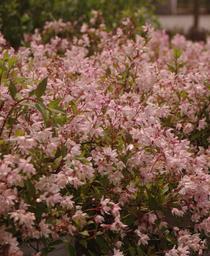 Yuki Cherry Blossom® (‘NCDX2’) Slender Deutzia is a color breakthrough by Dr. Tom Ranney of NCSU. Normally a white flowered groundcover shrub, Yuki Cherry Blossom® is covered with delicate soft pink flowers in April and May. The small green leaves are borne on graceful arching branches which root where they touch the ground, making Deutzia x Yuki Cherry Blossom® an excellent low maintenance groundcover. The fall color is bronzy purple, which adds another season of beauty. 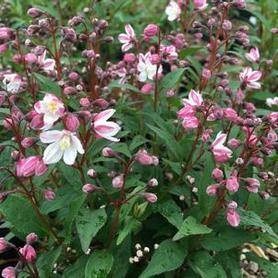 Yuki Snowflake® ('NCDX1') Deutzia blooms heavily in April and May, covering this low mounding shrub with a multitude of bell-like white flowers. The delicate green leaves are held on arching branches which root when touching the soil making Deutzia x Yuki Snowflake® an attractive shade tolerant groundcover. The foliage turns shades of burgundy in fall and is most colorful when grown in full sud. A lovely hybrid from the work of Dr Tom Ranney of NC State. 'Nikko Blush' Slender Deutzia is a cross made by the US National Arboretum between Deutzia gracilis 'Nikko' and Deutzia x rosea 'Carminea'. The result is a plant long sought by plant lovers, with bright pink buds opening in April and May to abundant soft pink flowers on arching low growing branches. 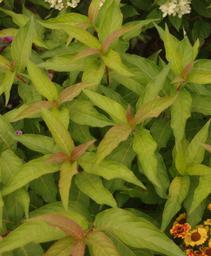 Like 'Nikko', 'Nikko Blush' makes an excellent groundcover, and would be particularly attractive growing down a wall. The fall color is shades of burgundy. 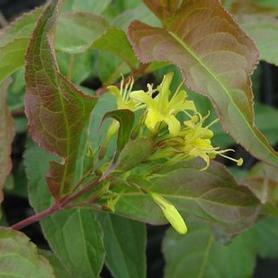 'Copper' Bush Honeysuckle has sulfur yellow flowers in July, over copper colored new foliage. The fall color is shades of bronze, orange and red. Diervilla lonicera 'Copper' is a very tough, maintenance-free plant, and tolerates dry shade well. Insects love the flowers. 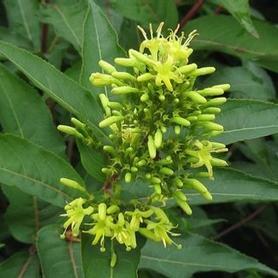 PRN Preferred: A true multi-seasonal plant plus it is native and deer resistant. That's impressive. 'Troja Black' Georgia Bush-honeysuckle lights up the garden in both spring and summer. The new foliage emerges in shades of burgundy and bronze maturing to a dark green in summer. The trumpet-like deep yellow flowers appear in June and July on the tips of the new growth. Diervilla 'Troja Black' attracts hummingbirds, butterflies and moths to its nectar supply. Fall color is a strong red. 'Butterfly' Southern Bush-honeysuckle has delicate bright yellow flowers June to July over green, disease-free foliage. The fall color of Diervilla sessifolia 'Butterfly' is shades of purple. It does well in dry, shady sites. A selection from Pieter Zwijnenburg of Holland. Firefly™ Nightglow™ ('El Madrigal') Bush-honeysuckle comes from the Blomin' Easy® line of introductions, and is an exciting foliage color break. 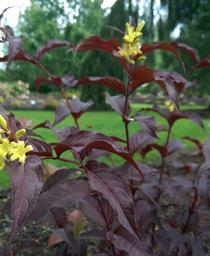 The leaves are a dark reddish purple, making a striking setting for the sulfur yellow flowers in June and July. The leaf color becomes more intensely red in fall before dropping. The blooms are real pollinator attractants, so this is a good native shrub to light up the garden. Kodiak® Orange Bush-honeysuckle puts out vivid orange new growth in he spring and summer. Mature leaves are green, and are topped with bright sulfer yellow flowers throughout the summer, attracting butterflies, pollinators and hummingbirds. 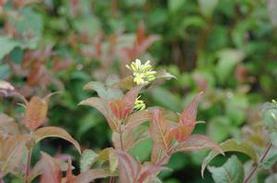 Diervilla is a wonderful native for its compact neat habit and its showy orange red fall color. Kodiak® Orange is also very versitile, as it does well in sun and shade, average and dry soils, and areas with deer pressure. Kodiak® 'Red' ('G2X885411') Bush-honeysuckle is a multi-purpose small shrub. The new growth emerges in shades or red and bronze in spring and summer. The spreading branches are tipped with sulfur yellow trumpet shaped flowers for an extended period, attracting butterflies, hummingbirds and other pollinators. Then in the fall, Diervilla Kodiak® 'Red' puts on an extraordinary show as its leaves turn bright red. Use as a specimen or a low hedge.